By maintaining an open mind and adapting to industry changes, Deborah Stephenson has excelled in various nursing roles over the last 38 years. 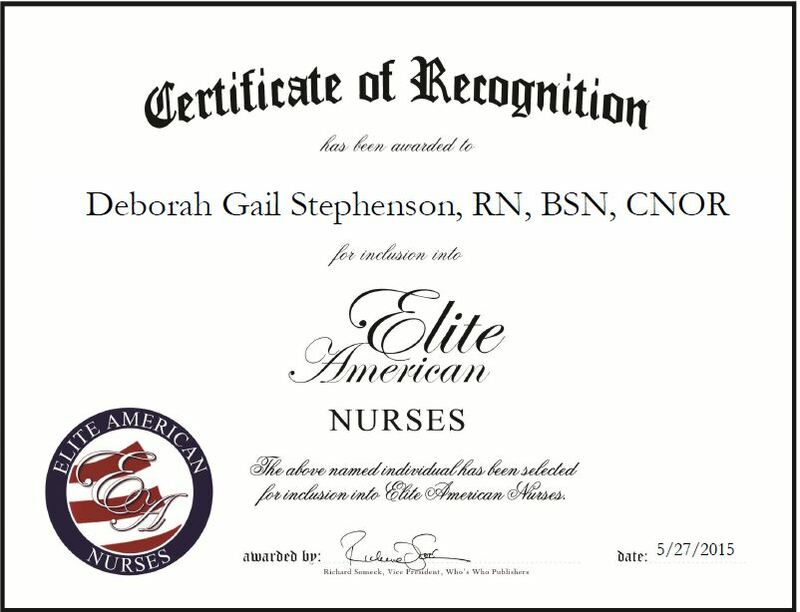 Having served in the United States Army Nurse Corps for 16 years, followed by 18 years with the health care division of the Kimberly-Clark Corporation, she refined an expertise which includes critical care and operating room nursing, legal nursing consulting and technical support. Ms. Stephenson established DGS Consulting just a few years ago to parlay all of the industry knowledge she has gathered to those emerging in the field. For Ms. Stephenson, there is not just one rewarding part of her career. Fortunate to travel the world, she considers every facet of her job responsibilities to be inspiring and worthwhile. The people she has met along the way have influenced her perspective and given her a wider frame of reference with which she consults. An award-winning nurse, Ms. Stephenson remains current with trends by reading the Association of PeriOperative Registered Nurses publication and Nursing Management. Further, she is affiliated with the American Nurses Association, Inc. and Sigma Theta Tau International. In 1977, Ms. Stephenson received an associate degree in nursing, which laid the foundation for her exponential success. Thereafter, she completed a Bachelor of Science in nursing and became a registered nurse. She retained various other professional titles throughout her tenure in order to expand her repertoire of services. By 1982, she was recognized as a certified operating room nurse, a licensed practical nurse, and a certified legal nurse. This entry was posted in Consulting and tagged Army Nurse Corps, critical care, legal nursing consulting, operating room nursing, practical nurse. Bookmark the permalink.